“Secret” details hidden in plain sight are pretty much the rule in New York City, and the “Scrabble” street sign in Jackson Heights is a fine example. 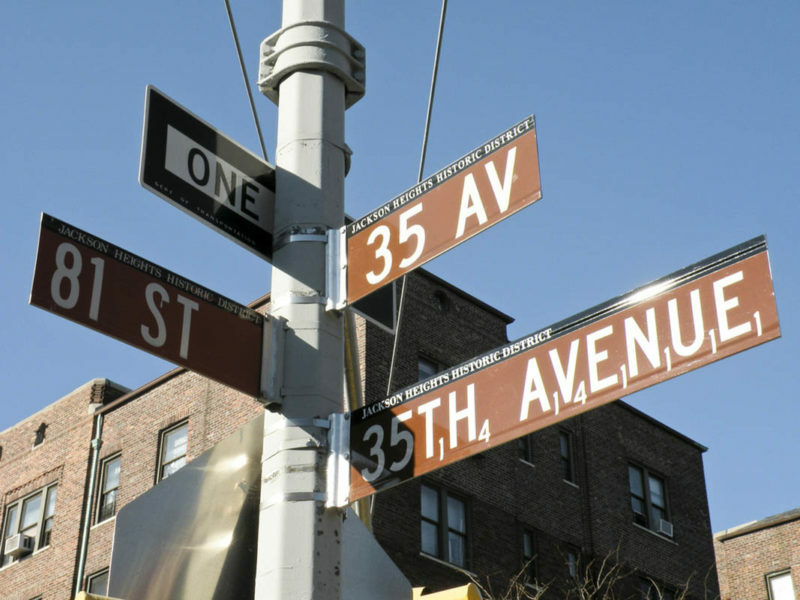 The letters that make up the sign marking 35th Avenue where it meets 81st Street in the neighborhood’s historic district are–if you look more closely than you’d ever really look at a street sign–accorded numbered points below each letter, Scrabble tile-style. The sign honors the fact that the beloved geeky pastime–according to Hasbro, three out of every five American homes harbor a Scrabble board–was invented right here in Queens by the Poughkeepsie-born Alfred Mosher Butts in 1931. Butts was an architect, and as history tells us, an architect generally needed to find an alternate way to keep busy during the Great Depression. The story behind the game was given its well-deserved day in the spotlight in the 1990s by a Jackson Heights resident in collaboration with a descendant of Alfred Butts. The two found the history and its family and neighborhood ties fascinating. Jeffrey Saunders worked with the elder Butts’ great-nephew, Robert R. Butts, to fill in the blanks. Alfred Butts had created a game called Criss-Cross Words: Players would be challenged to arrange hand-cut tiles, each bearing a letter and the number of points the letter was worth, into words. 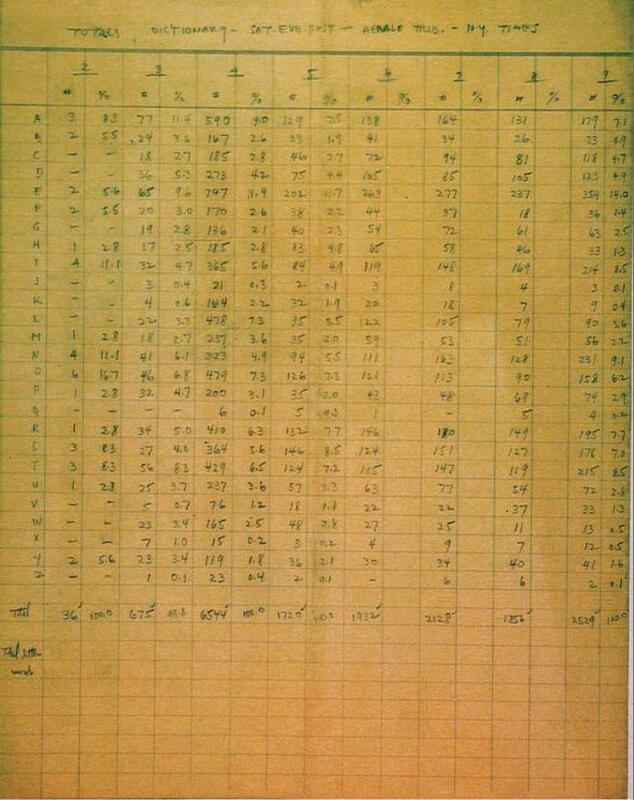 Legend has it that Butts chose the frequency and distribution of game tiles by counting letters on the pages of the New York Times, the New York Herald Tribune and the Saturday Evening Post. On Sunday nights during the Depression, friends and neighbors would gather at Butts’ apartment to play; Butts tweaked and improved the strategies and design over time. Like anything fun, the game went viral and spread to the community at large, possibly even supplanting bingo, records show, at the Community Methodist Church social room on 35th Avenue. In 1938, Butts filed a patent for his invention, which, ironically, went unnamed until he dubbed it “Lexiko,” then eventually “Criss-Cross Words.” For over 10 years he continued to be rejected by potential corporate sponsors; the Patent Office rejected his application twice. When fellow New Yorker James Brunot–he and his wife were big fans of the game–contacted Butts about mass-producing his invention, Butts was more than ready to let go of it. It was Brunot who designed the game’s original color scheme along with the 50-point bonus for using all seven tiles to make a word. According to Hasbro, Brunot and Butts came up with the name “Scrabble,” meaning “to grasp, collect, or hold on to something,” together, in 1947. The first Scrabble factory was an abandoned schoolhouse in rural Dodgington, Connecticut, where Brunot barely kept ahead of the orders that began to pour in. Then the chairman of Macy’s discovered the game and placed a big order. By 1952 the little scrabble factory was scrambling to send out more than 2,000 sets a week. Almost four million Scrabble sets were sold in 1954 alone. In 1971, Brunot and Butts sold the rights to the game to a company called Selchow & Righter. Butts netted $265,000 in royalties while Brunot received $1.5 million. Coleco Industries Inc. took over the game in the 1980s; when Coleco went bankrupt, Hasbro Inc. snatched up the game, after which it went on to become one of America’s most popular board games. The game has had to keep up with the times: In 1994 Hasbro announced plans to remove nearly 200 words deemed too offensive for the official Scrabble dictionary including “turd,” “fart” and “fatso.” Under pressure, Hasbro eventually compromised and, like record companies who manage rap stars, published two official dictionaries–one with the dirty words included, the other without. More Scrabble-relaetd drama ensued when Hasbro and Mattel filed lawsuits against two brothers from India who unleashed “Scrabulous,” on Facebook’s bored-at-work masses in 2006; Scrabulous became the most popular application on Facebook, attracting more than 500,000 players a day. Not unlike a plot on “Silicon Valley,” Jayant and Rajat Agarwalla responded to the copyright infringement accusations with a tech-savvy counter-move. Newly-dubbed “WordScraper,” the game acquired a changeable board that could be rearranged to form the original Scrabble board by the player him- or herself. Hasbro eventually dropped many of their lawsuits against the brothers. In 1993, Mattel outbid Hasbro for the international rights to the game (the magic bid was $90 million). The fifth edition of the Scrabble dictionary was released in 2014 with over 5,000 new words. 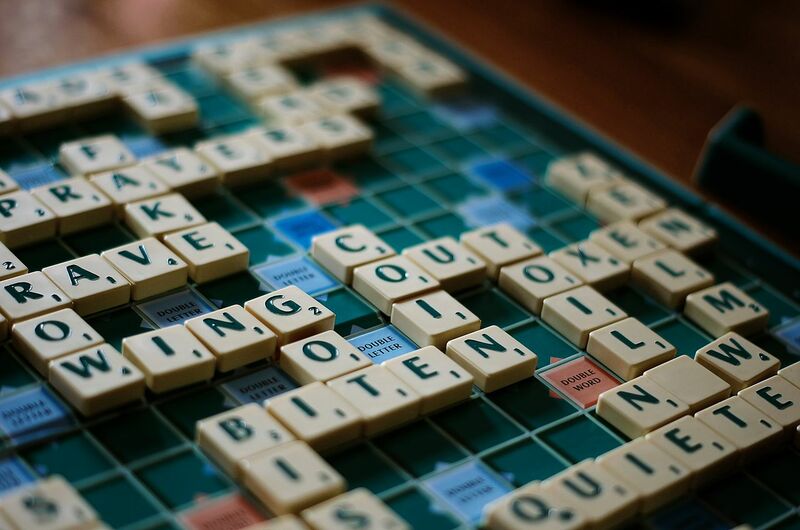 Scrabble has been translated into 22 languages from Arabic to Afrikaans. An annual Scrabble tournament attracts more than 500 highly-skilled and competitive adult Scrabble players. Hasbro claims that three out of every five American homes have a Scrabble board. According to Time magazine, fans of the game include Madonna, Martha Stewart, Barack Obama, Bill and Hillary Clinton, Keanu Reeves and Queen Elizabeth II. But it wasn’t until 1995 when Jeff Saunders began conducting his research that the first sign quietly appeared at the corner of 35th Avenue and 81st Street in Queens, marking the birthplace of the game. The sign’s appearance was part of the Historic District Street Sign Program, a project led by the New York Landmarks Preservation Foundation under the leadership of then-chair Barbaralee Diamonstein-Spielvogel, who had to get permission from Hasbro to include Scrabble numbers; the Department of Transportation took on installation duty. The signs in the program–including the “Scrabble” sign–were designed by noted designer Massimo Vignelli. The Historic District sign disappeared in 2008, as quietly as it had appeared. 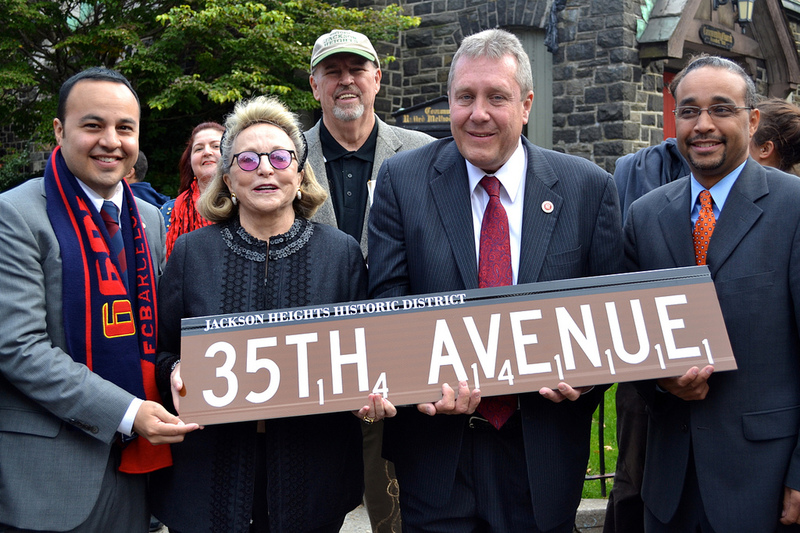 The Scrabble fans of Jackson Heights wanted it back, and in 2011, the efforts of Councilman Daniel Dromm resulted in the reinstatement of the (14 points worth if anyone wonders) sign. 2018 marks the game’s 80th anniversary, a fact which did not go unnoticed by a group of local letter lovers. According to the Jackson Heights Post, a special tournament was held on Saturday April 14th at the Community Church at 81-10 35th Avenue, hosted by the Jackson Heights Beautification Group. The exact date honors the year the game was patented by its inventor.